Create a stunning universe of light in your child's room with the impressive Stars and Moon LED Light Fitting. This fabulous multi function fitting can be used as a soft night light or a brighter room light. 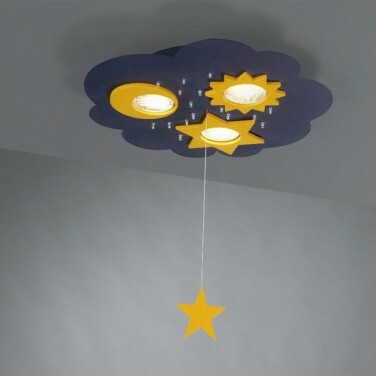 A fantastic and funky ceiling light that will really impress kids and elevate you to "cool" status. Turn on at the wall to create a stunning starry night sky or pull on the star pull cord to operate the three nine watt lamps that resemble larger, bighter stars and a moon so that you can set just the right tone in their room. Your kids will love this bright and interactive light with it's cool styling and impressive size and brightness.